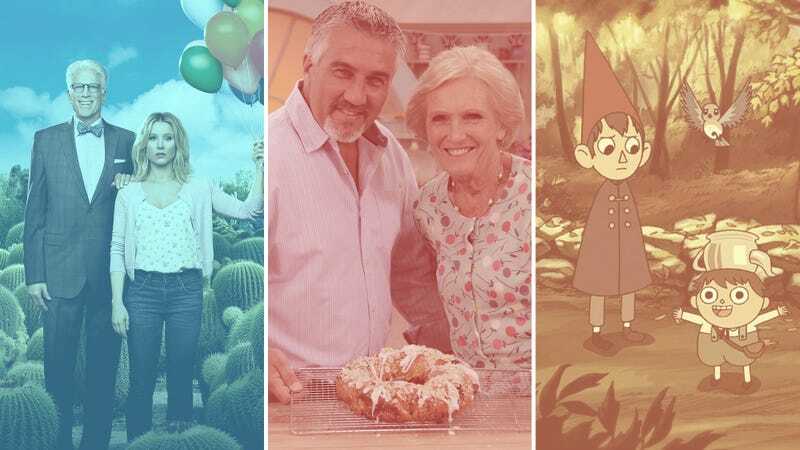 The Good Place (Photo: NBC), The Great British Bake-Off (Photo: PBS), and Over The Garden Wall (Screenshot: Over The Garden Wall). Graphic: Libby McGuire. The time has come once again for Americans to give thanks for all they have, be it scarce (like time) or plentiful (like all the television content, produced Stateside and abroad, currently pumped into our homes via broadband). And while we wouldn’t begrudge anyone their long weekend Stranger Things marathons or their annual rewatch of “The One Where Ross Got High,” The A.V. Club also knows that the wealth of streaming options can sometimes make your eyes feel bigger than your stomach. Here, for your holiday enjoyment, are some choice cuts trimmed from a bird that seems to get bigger and bigger every year. A piping-hot batch of recent streaming premieres, because TV never takes a holiday. For those with more hectic over-the-river, through-the-woods plans, or anyone just looking to whet their appetite for heartier viewing, these limited-run series, short-lived favorites, and web shows can be squeezed in between courses. Like a Jello-O mold dotted with fresh fruit, here are some TV confections that both kids and adults can enjoy. Missing the caring chaos of your own clan? Or seeking one that’ll make your own look saner by comparison? There’s plenty of family to go around. Before the best-of lists start dropping, get acquainted (or re-acquainted) with the finest TV 2017 has had to offer. Note: This article discusses plot details from the first-season finale of The Good Place. Comedies whose progressive bent could start an argument, but are so well-made they’re likelier to stir up laughs. You’ve tranquilized yourself with a rich, hearty meal and generously poured drinks. Now for dessert: TV to match your placid (or plastered) state. The kitchen competition otherwise known as The Great British Bake-Off is a guaranteed nerve-soother even on days that don’t involve the preparation of heaping gobs of food; as a bonus, the most recent season added to Netflix is the fond farewell to original-recipe GBBO, chronicling Sue, Mel, and Mary’s final hours in the baking tent. Indulgent nighttime soaps for capitalism’s favorite day of the year. You’ve tested your waistband. Now test the seat of your pants with these epic binges, many of which you’ll need to complete on the other side of the four-day weekend.